Take a look at the footwears you are wearing right now. Are they sneakers? Are they flats? Are they boots? Where in the world did they come from? When was the last time you stop for a moment to think about the trend that the footwears on your feet were participating in? Footwears are not just a fashion statement. In fact, they are a window into the culture and function of people that wear them comfortably on their two feet. Even though sneakers and flip flops can be found worldwide, every culture also has a particular type of footwear that was made especially for its people’s needs and remains an important part of what makes their traditional clothes original and unique. Recently, there was the rise of trend to Russian footwears industry. A large number of women stopped wearing high heels in favor of comfortable flat shoes, apparently aware of the harm that can be caused by high heels. 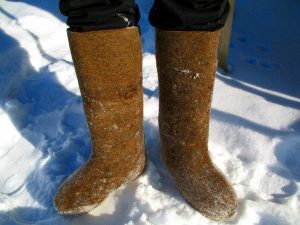 Footwears designed in Russian traditions is mainly valenki which are also known as Russian felt boots or winter boots. Valenki catches second wind today as it is highly appreciated in the USA, Great Britain, and other countries. But, little did you know, valenki is not the only footwear respected in Russia. Another footwear worth your attention is Russian boots for folk dances. All dance Russian boots are made by professional team to serve the dancers long and comfortable feelings. I have a round-up list of 8 top authentic footwears made in Russia. Come on a short trip with me about footwears in Russia. Valenki boots are traditional Russian winter footwears. If we take valenki by its literal meaning, it means “made by felting”. The shoemakers use sheep’s wool that has been compressed by hand until it turns into felt as the main material. Those warm felt boots have been worn by generations of Russians. They go well with traditional style or even street style. For centuries they shod the feet of Russian peasants and tsars. Unfortunately, valenki boots are not water-resistant. Therefore, they are often worn with a strip of leather on their sole or rubber galoshes to protect the felt. The galoshes also protect the valenki’s soles from wear and tear. Valenki slippers, also known as chuvyaki slippers, can be worn both indoors and outdoors. They have been part of the traditional Russian dress and even modern’s dress, be it for noblemen, children, soldiers, and even peasants. Much like valenki boots, valenki slippers use galoshes to protect the felt, too. Actually, galoshes are not a Russian invention. However, they became extremely popular there because of all the mud and slush on the streets, especially during spring and fall. Holiday valenki is no ordinary valenki. They are beautifully embroidered and have been around for 100 years. They are not supposed to be worn every day, only on feast days. Fact is, not everyone can afford them, only well-to-do peasants can own special footwear for special occasions. The holiday valenki are passed down from one generation to the next. They are made in the Kazan province, which, from the mid-19th century on, was a home to one of the largest valenki manufacturers in Russia called the Brothers Komarov. The word valeshi actually means “sewn valenki”. Valeshi are some contemporary twist on boots made from natural felt. Unlike the flawless valenki, valeshi are sewn from the thickest felt. Some are even made to be worn around the house like regular slippers; others are made for the outdoor activities and feature a glued-on rubber sole. Russian leather shoes are renowned for their ability to resist water. It is not at all surprising since Russian leather is widely considered to be the finest in the world. What makes it even more unique is its aroma that is able to repel insects. If you want the perfect fit for your feet, Russian leather shoes are the real deal. They have a total control over design and are handmade products. Only the best materials are used. So, you can expect them all hand lasted with welted soles sewn on. Since the day Russia applied a universal military obligation to its people, tactical boots became an important piece of military uniform. During training days, you need them when you go on grueling marches, stand in formation during heat and rain, and tackle tough obstacle courses. Russian army boots embody the real tactical boots the best. Russian army boots provide massive support and security. Just as mentioned before, galoshes were not a Soviet invention. But, they went into mass production in Russia in the late 19th century. They also went on to enjoy tremendous popularity in the USSR. Back in the 1960s, different shapes of galoshes began to appear. They were specifically made for both men’s and women’s shoes, and sometimes children wore them over felt boots to do activities during winter. Today, galoshes remain an essential and functional item of footwear in Russia. I hope you have enjoyed learning about 8 top authentic footwears made in Russia. Perhaps you have even learned something you did not already know. You can use this knowledge to enhance your looks whenever you are stuck for style inspiration. With all those footwears mentioned above, you can start experimenting different types of footwears with your outfits.